Munich, of Germany’s most exciting cities, is famous for hosting both the world’s largest folk festivals, the Oktoberfest, and the largest science and technology museum in the world. But it also sits right next to the Alps, allowing you to wake in the city, ski all day long and return to spend the night in town again. Its Christmas celebrations include the traditional markets and mulled wine, but also an alcohol free version: the Kinderpuntsch, which kids love. However, travelling alone, with your partner or with a group of friends is totally different from travelling with children –they determine what you visit, have little patience and many special needs: places to play, a certain number of breaks, regular meal times, changing tables or high chairs. The author of this book not only knows the city intimately, she has been living there for seven years and has created a half-German family in it. She is also an eager traveler and very familiar with travelling with children. Her guide provides key tips to visiting the Bavarian capital so that both kids and grown-ups can make the most of it. I worked for years in marketing tourist destinations. During that time I travelled the world for work. Later on I moved to Munich, I had two fantastic kids and changed my professional path to one where I didn’t need to travel, but to write and communicate instead. 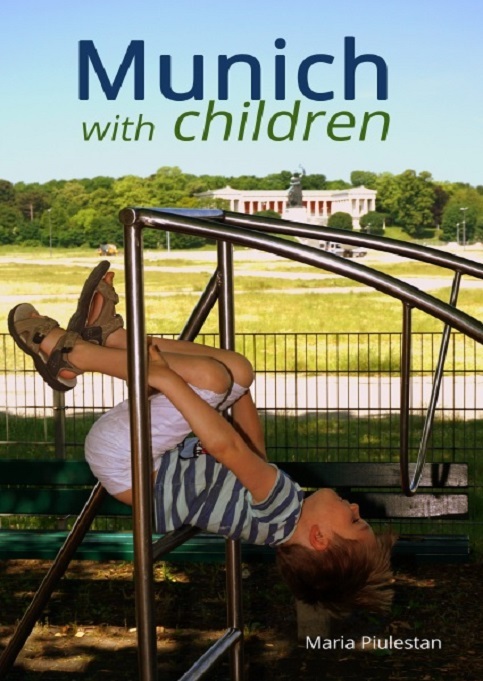 I also started writing for pleasure: I became a blogger and created a resources guide for foreign parents in Munich, and it became very successful. And I continued travelling too, but for pleasure instead. But then I realised that my travelling customs had completely changed since I started doing it with my children: Until then I had always liked to find my way around with travel guides, but now these were now quite useless: What they suggested was usually not children orientated, or my kids didn’t enjoy it very much. What we looked for when we travelled was no more spending hours in an art gallery, resting in a spa or visiting ruins, instead we were now keen to find the coolest playgrounds in town, routes in nature where we could go with a pushchair or only visit museums where we could touch things, learn or experiment. That’s when I decided to join my tourism knowledge, my pleasure for communicating, my thrill for writing and my joy for travelling with my kids, in this guide. People who plan to visit Munich with children will enjoy this incredibly childfriendly city with its loads of wonderful playgrounds, fantastic swimming-pools, fun shows, the kind of museums that kids like, super interesting things to see and many other places around Munich: leisure parks, nature round the corner from the Alps, loads of lakes, forests, caverns… Both kids and grown-ups will love it. I would have never been able to finish this project without the invaluable amount of help I have received from so many people: mamaenmunich’s readers who have inspired me to write this: Helen, who helped me with the title and the marketing ideas; Jordi, who gave me so many tips; Alberto who taught me some desktop publishing; Landa, who listened to my comings and goings every step of the way; Caro, who introduced me to my editor; Gemma for her ideas and enthusiastic motivation; my mom-friends, who have helped brainstorm some of the suggestions listed here; Mikey, who has read, re-read and proofread every single word of this book, without his fantastic help this wouldn’t have been half as wellwritten as it is, Caroline, who nicely checked the format, Anton, who kindly checked the German spelling and helped me with the history facts; my family: most especially my loving mother and brother, but also my German family, they all are always proud of whatever I do; Walter, who, with his incredible eyes, is author of most of the images in this book and whose unconditional love, support and patience allow me to set and reach all the goals I dream, no matter how crazy. And Max and Leo, with whom I was luckily born a second time, to a life full of adventures, trips, fun, knowledge and so much love; the two have been the real reason behind this project. This book is really because of and written for them. Título: Munich with Children. A guide to Bavaria’s capital for the whole family.